1. Warm up the oven to 350 degrees. Cube up the Slices of Barely Bread and put in the oven for about 15 minutes. 2. 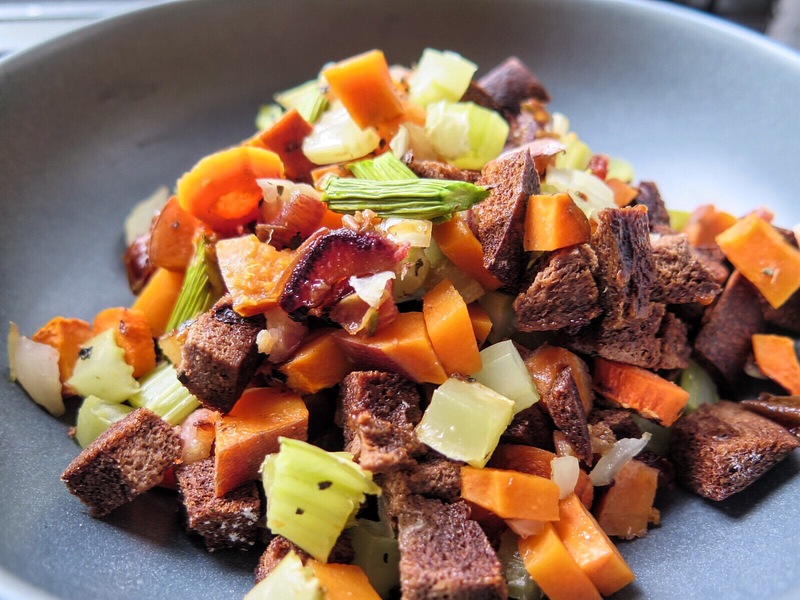 While the cubes are crisping up, begin dicing up the sweet potato, celery, asparagus, carrots, and bacon. Also finely dice up the onion. 3. Take out the bread cubes and put into the mixing bowl. Once the items in#2 are diced up, place in the bowl as well. 4. Add in ground basil, sea salt, pepper, and coconut oil, then mix with your hands so every item gets coated. 5. Dump contents into a baking dish and spread evenly. Drizzle the top with the splash of coconut milk and toss in oven for 40-45 minutes.